This 55 minute class is for beginner/advanced beginner gymnasts. Athletes will work within JAG's band system to earn their first achievements in gymnastics. 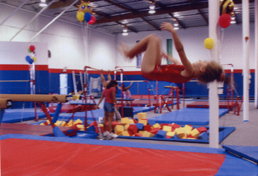 Blue skills include cartwheels, handstands, forward rolls and backward rolls as well as basics on bars, beam and vault. Yellow skills include roundoffs, and continued development of cartwheels, handstands and rolls as well as on bars, beam and vault.